This month, our choice honors the woman who gave life to Princess Leia, and was just as fierce and strong off-screen as well. Carrie Fisher passed away suddenly in December, and all nerds and geeks mourn her loss. I picked this image because Leia looks pretty badass here. It’s so simple that I really enjoyed being more creative and less literal with this one. I colored the swirls in a gradient of different shades of green and blue, which I think came out looking pretty cool. Coloring Leia’s dress white would have been boring, so I went with pink! This reminded me of the Women’s March a few weeks ago, where many women held signs with Princess Leia on them, inspiring them to resistance. 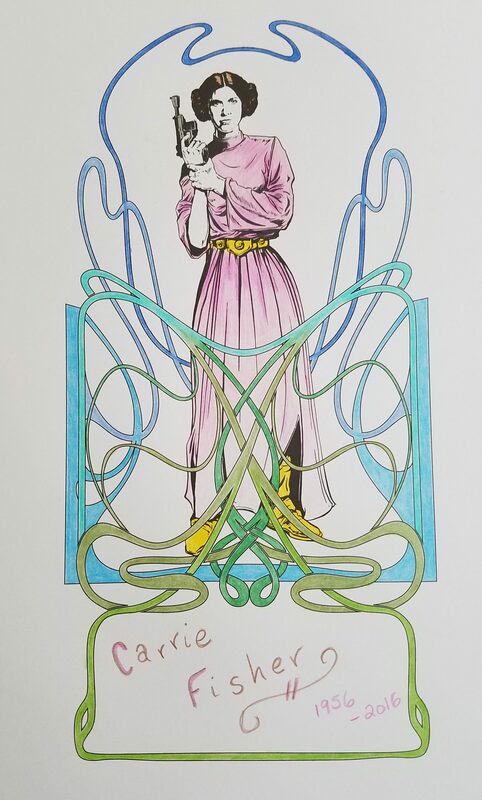 I was also inspired by Kiri’s picture of Leia in a blue ombre dress, which was inspired by Padmé’s handmaiden dress. I decided not to color her skin because it looked more like street art or something that way. Carrie Fisher was not just an entertaining actress and writer; she was also a tireless advocate for feminism and mental health. I don’t think her life was an easy one, but she kept on living, and living by her own rules in particular. She is still living, in all of our hearts and memories. Be sure to check out Kiri’s version of this picture as well, and read her moving discussion of Leia’s impact on her life and in fandom. Oooo I love the swirlies! And I almost went with ombre as well but instead decided to keep the classic white. And I like that the swirls we chose were similar in color (blues and greens) but opposite. And we both colored in the top of her hair! Nice job. I think yours looks more badass than mine…I feel like mine was more serious. Haha, mine was more of a statement, yours was more personal and reflective. A good pair! Aw thank you! What fun, I will check it out.